DNA cyclepath to Shelford, by Keith Edkins. Image licensed under Creative Commons Attribution-ShareAlike 2.0 license. The colour code is as follows Adenine:Green, Cytosine:Blue, Guanine:Yellow, Thymine:Red. Cambridge, a city known for its abundant bicycles and cutting edge scientific research, has finally found a way to combine these two things… In 2005, as a celebration of the 10,000th mile of the national cycle network, Cambridgeshire County Council and Sustrans joined forces with the Wellcome Trust Sanger Institute to create a DNA-inspired cycle path. 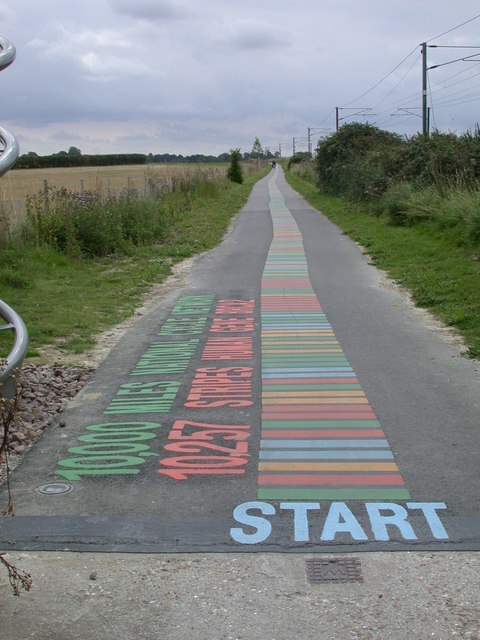 The path, which runs from Addenbrooke’s Hospital to Great Shelford, is decorated with 10,257 colourful stripes which represent the four nucleotides of the BRCA2 gene. BRCA2 (Breast Cancer Type 2 susceptibility protein) was discovered at the Sanger Institute by Prof. Michael Stratton and Dr Richard Wooster in 1995. This tumor suppressor gene binds to and regulates another protein to mend DNA breaks. Mutations of this gene produce short proteins that are unable to repair broken DNA and can lead to the development of various cancers. BRCA2 is just one of the 30,000 genes in the human genome; if the entire human genome were laid down at the same scale, the path would circle Earth about ten time. 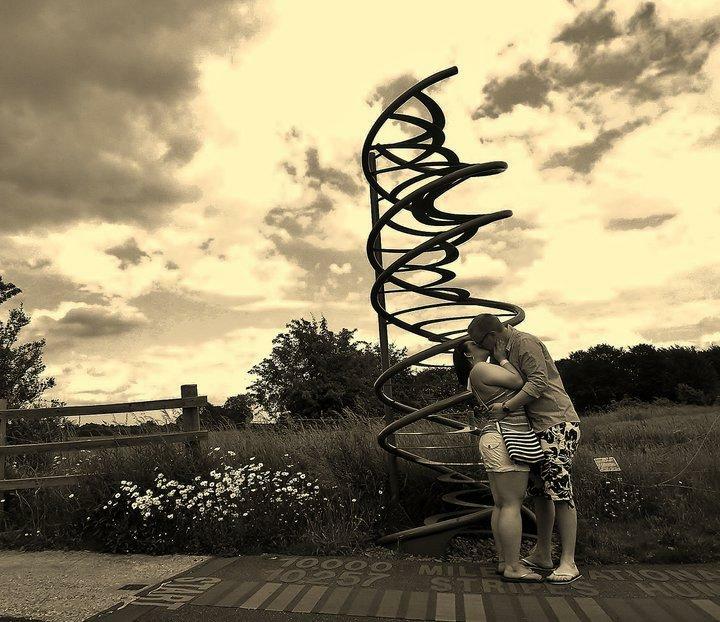 DNA Helix, Cambridge, by Elena The. Image used with author's permission. As it is, the path runs alongside a railway for two miles through the flat countryside of south Cambridgeshire and has become a popular commuter route since being opened by Nobel Prize winner Sir John Sulston. Each end of the path is marked by a sculpture of the DNA double helix magnified 750,000,000 times. To find the first sculpture and begin your cycle to Great Shelford, follow the signposts dotted around the Addenbrooke’s site. The presentation of an Royal Society of Chemistry (RSC) National Chemical Landmark plaque took place on 1st December 2009 to mark the lifelong dedication and work of Dr Elsie Widdowson (1906-2000), a pioneer in nutrition science. A graduate of Imperial College, she obtained a PhD in 1931 for research into the carbohydrate content of apples. In 1933 Dr Widdowson decided to spend some time in the King’s College kitchens to learn about large-scale catering, prior to undertaking formal study in dietetics. Whilst there she met Prof Robert McCrance who at the time was analysing plant foods for carbohydrates as part of his study of optimal diabetic diets. Their collaboration lasted 60 years and included the epoch-making publication “The Composition of Food” first published in 1940. The sixth edition of this text is still in print, 70 years later. Her researches informed the Government on aspects of wartime rationing, especially in connection with the addition of vitamins and mineral supplements to basic foodstuffs. For instance, she suggested that wartime bread should be enriched with calcium salts to compensate for the anticipated reduction of diary products in the diet. The calcium fortification of white flour used for breadmaking remains a legal requirement today. For the seven years prior to her death on 14th June 2000, she was the most highly honoured UK female scientist, having been appointed both CBE and Companion of Honour, the latter in 1993. Elsie Widdowson spent most of her working life in Cambridge so it was highly appropriate that the Landmark ceremony took place at the laboratory named after her, at the Medical Research Council’s Human Nutrition Research Unit, Fulbourn, Cambridge. The Director of the Unit, Dr Ann Prentice, gave an in-depth account of Elsie’s life, and the Landmark plaque was presented to Dr Prentice by Professor David Phillips, at the time President-elect of the RSC. 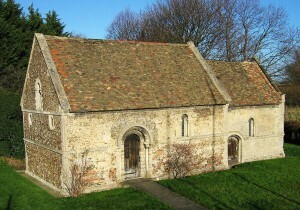 The Leper Chapel (or, the Chapel of Saint Mary Magdalene, to give it its proper name) is one of the oldest surviving buildings in Cambridge. It is thought to have been built around 1125 and is the only remaining structure of a leprosy hospital that once stood just outside this fenland market town. It was common at that time to build such hospitals on a main road on the outskirts of a town; this allowed for isolation, but also gave the lepers a source of income as they could beg reasonably profitably along the road (in this case, the main road between Cambridge and Bury St. Edmunds). Although the chapel retains its evocative name, the leprosy hospital ceased to admit new patients after 1279 and most of the residents moved to a colony outside nearby Ely. The chapel is most famously associated with Stourbridge Fair – the largest medieval fair in Europe. Permission for the fair had been granted by King John in 1199 so that the lepers might supplement the income they received from begging and farming. It took place every September on Stourbridge Common, which runs between the chapel and the nearby River Cam, and attracted merchants from all over England and Europe. The fair died out in the 1930s, but has recently been revived by Cambridge Past Present & Future which owns and maintains the site. The chapel, tiny and intimate, was originally built in Romanesque style. Due to re-building work from the 13th century onwards, the present chapel contains remnants of several different architectural styles, but it is still possible to see many of the original features of the chapel, especially along the east wall. During the 16th, 17th and 18th centuries, the chapel was rarely used for religious services instead it was used variously as a shed, a store and a pub for Stourbridge Fair. Early in the 19th century, the chapel was bought and restored by Thomas Kerrich who then gave it to the University of Cambridge. In 1951, the chapel passed into the hands of the Cambridge Preservation Society (now Cambridge Past Present & Future) and is currently used as a place of worship and a centre for the arts. Astronomers have made their home in Cambridge since medieval times. John Holbrook, Master of Peterhouse, Cambridge (1418-36) compiled the ‘Tabulae Cantabrigienses’ for 1430 and C. Kyngeston a Fellow of Peterhouse made observations on the eclipse of the sun in Cambridge on 24 May 1517. Still perhaps the most famous scientist to study in Cambridge was Sir Isaac Newton, who as a Fellow of Trinity College compiled his famous work the ‘Principia Mathematica’ published in 1687. In 1704 the Rev. Thomas Plume left money in his will for a chair of astronomy, which became known as the Plumian Professorship. The Plumian professor had access to an observatory built on to the Gate House of Trinity College from 1739 to 1797, and another observatory existed from 1765 to 1859 at St. Johns College . However, there was a need for a modern observatory on a good site away from the smoke of the town. The Cambridge Observatory was established on the western outskirts of Cambridge in 1823. It was funded half by the University of Cambridge and half by public subscription. Of the money raised, the largest sum was spent on the impressive neo-classical observatory building. Money was then needed for instruments and for staff. 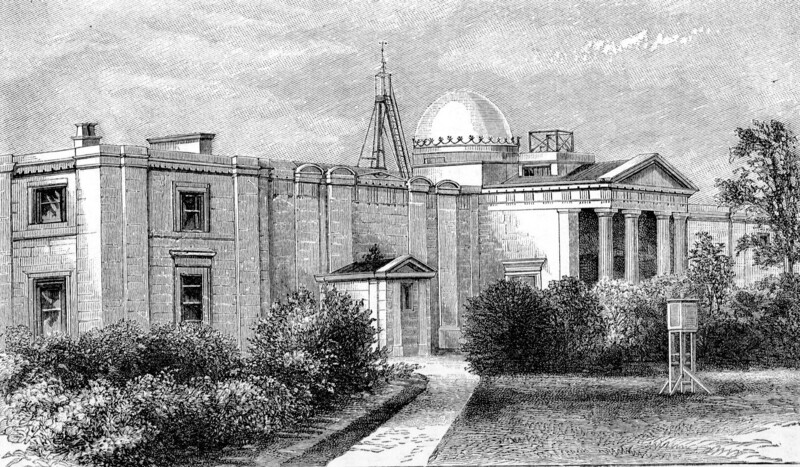 The Observatory was supervised by the Plumian Professor of Astronomy, who in turn reported to a University committee known as the Observatory Syndicate. The Professor was provided with a house forming the east wing of the building. The first Plumian Professor to take residence was Robert Woodhouse (1773-1827). 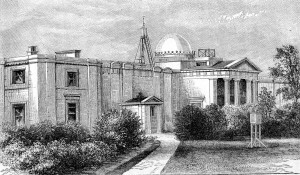 Woodhouse had published ‘An elementary treatise on astronomy’ in 1812, but by the time the Observatory had opened, he was already ill and died in December 1827. The first effective Director of the Observatory was therefore G. B. Airy (1801-1892), who succeeded to the Plumian Chair. 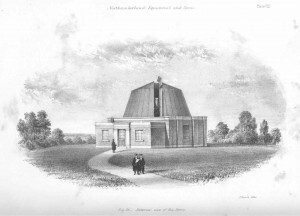 Airy played a significant role in obtaining the Northumberland Telescope in 1838, a 12-inch refractor still present in a dome in the grounds . When Airy left Cambridge to take up his post as Astronomer Royal in 1835, his successor as Plumian Professor and Director of the Cambridge Observatory was James Challis (1803-1882). Challis lived at the Observatory until 1861. In 1846 Challis carried out with the Northumberland Telescope a systematic search for a new planet, on the basis of calculations provided by John Couch Adams. On the continent, the planet later to be called Neptune, was predicted by Urbain Jean Joseph Le Verrier (1811-1877) and discovered by J. G. Galle (1812-1910) and Heinrich Louis d’Arrest (1822-1875) on the night of 23 September 1846 at the Berlin Observatory. Key to the success of Galle and d’Arrest was the possession of the star chart (Hora XXI Aquarius) of the Berlin Academy Star Atlas of Carl Bremiker. This chart of the atlas had been printed in 1845 but had not yet been distributed. It allowed Galle and d’Arrest to find the planet rapidly, whilst Challis had to map every star in the area . The Northumberland Telescope dome when new. Adams, is of course best known for having predicted the position of the planet later called Neptune independently of Urbain Le Verrier in 1846. In 1861 as Lowndean Professor, he also became Director of the Cambridge Observatory and took up residence in the East wing . In 1884 he represented Britain at the international conference that decided on Greenwich as the Prime Meridian of the world. On the death of John Couch Adams in 1892, Robert Ball, famous as an author and popular speaker in astronomy, took over as Director of the Observatory with the position of Lowndean Professor. Ball also moved into the house on the East wing of the Observatory which he extended. Eddington was Plumian Professor from 1913 to 1944 and lived in the Observatory until his death in 1944. He is famous for having promoted relativity theory in the English-speaking world and proving it right with his 1919 eclipse expedition . Indeed Einstein came to stay at the Observatory with Eddington in 1930. The Solar Physics Observatory (SPO) was established in South Kensington in the 1870’s. It had been shaped by Sir Norman Lockyer, who was very closely involved with it until 1913. In 1913 the Solar Physics Observatory moved to Cambridge to a site adjacent to the Cambridge Observatory and in 1946 it was combined with the University Observatory to become the ‘University Observatories’. 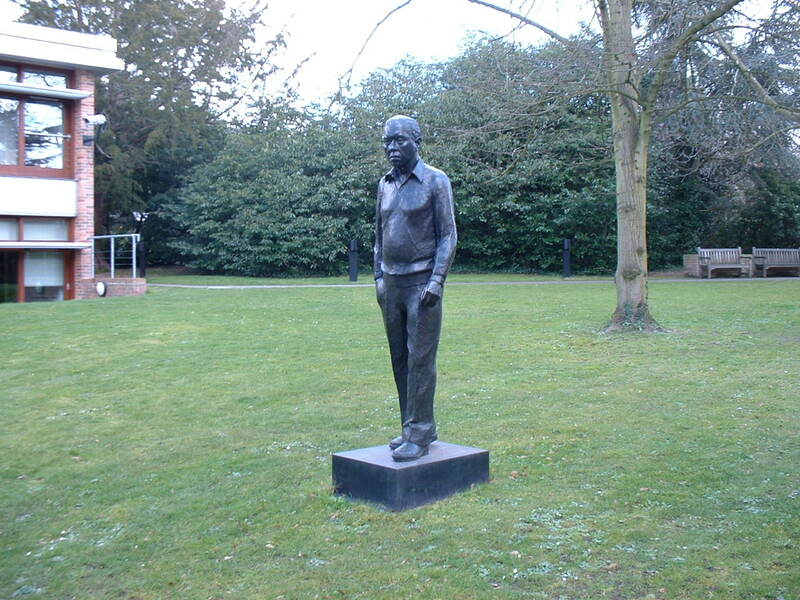 The Institute of Theoretical Astronomy was the brainchild of Sir Fred Hoyle (1915-2001). Fred Hoyle coined the term ‘Big Bang’ despite bitterly opposing the theory. He pioneered the theory of the nucleosynthesis of elements in stars. Hoyle was a controversial figure, with his theory of life in the universe and his science-fiction books. The Institute was established in 1967 with a small group of Hoyle’s associates. An article by John Walsh describes the political background to the founding of the Institute. It was to concentrate on theory, with no teaching responsibilities and with access to a computer. It had its own building with library set in the Cambridge Observatory grounds . The Institute of Astronomy was created on 1st August 1972 by the amalgamation of the Cambridge Observatories and the Institute of Theoretical Astronomy. The IoA is one of the largest centres for astronomical research in the UK, with about 140 astronomers. Active areas of research are cosmology, gravitational lensing, X-ray astronomy, galactic astronomy, clusters, stellar physics and instrumentation. Most observations are made with mountain-top or space telescopes, but some observations are still made on-site. Over the years, many famous astronomers, including Stephen Hawking, have worked at the Institute. The current Plumian Professor and Director of the IoA is Robert C. Kennicutt from Arizona whose interest is in extragalactic observational astronomy. Lord Rees, the current President of the Royal Society also has an office at the Institute. In November 2009 the Kavli Institute for Cosmology Cambridge opened on our site as a joint centre with other Cambridge departments with an interest in observational cosmology. In 1990 the Royal Greenwich Observatory was moved from Herstmonceux Castle in Sussex to a new building directly behind the Cambridge Observatory. A glass-walled corridor room provided a link between the two buildings. The government closed the Royal Greenwich Observatory in 1998. The library has existed as part of the Observatory since 1823, although it contains many books which are far older. A separate history of the Cambridge Observatory Library containing much history of the Observatory has been published by the author . This 8-inch refracting telescope made by Cooke & sons in 1864 went through a series of wealthy amateur owners before arriving in Cambridge in 1929. It belongs to the Royal Astronomical Society, from whom it is nominally on loan to the University. F. J. M. Stratton, The History of the Cambridge Observatories, Annals of the Solar Physics Observatory, Cambridge, 1, 1949. W. Airy (editor) Autobiography of Sir George Biddell Airy, (Cambridge University Press), 1896. D. Jones, Highlights of Astronomy, 12, 367-370, 2002. H. M. Harrison, Voyager in space and time, (Book Guild, Sussex), 1994. D. S. Evans, The Eddington Enigma, (Princeton), 1998. J. Walsh, Science, 157, 1286-1288, 1967.